Michael Pettis at China Financial Markets has some interesting comments via email regarding much needed China rebalancing and a timeframe for a possible Spain exit from euro. How will Spanish households react to a default on preferred shares and subordinated bonds, or even a very public discussion about the possibility of such a default? I don’t know, but I assume that it will speed up deposit withdrawals from the banking system even more. For that reason it continues to be a very good idea to keep an eye on Target 2 balances. These serve as a pretty good proxy, I think, for the behavior of depositors. Things are evolving in Spain exactly as we would expect them to evolve according to the sovereign-debt-crisis handbook. Unless we get real fiscal union in Europe, or Germany leaves the euro, or Germany stimulates its economy into running a very large trade deficit, or the euro depreciates by 15-20% against the dollar in the next year – all very unlikely, I think – I really see no reason to doubt that Spain will leave the euro and restructure its debt within the next few years. Target 2 stands for Trans-European Automated Real-time Gross Settlement System. It is a reflection of capital flight from the "Club-Med" countries in Southern Europe (Greece, Spain, and Italy) to banks in Northern Europe. Please see Target2 and the ELA (Emergency Liquidity Assistance) program; Reader From Europe Asks "Can You Please Explain Target2?" for a more compete description. 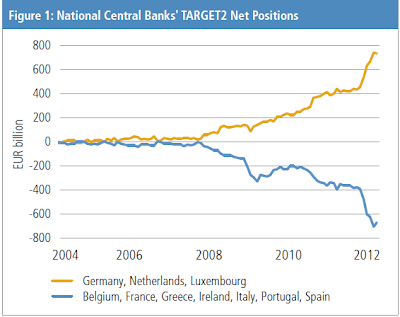 There is much misinformation floating around on how Target 2 works, what Germany's liabilities are, so please click on the above link if you are interested in target 2 balances. The following chart from PIMCO article ​​TARGET2: A Channel for Europe’s Capital Flight shows the capital flight through March. The problem has accelerated since then, because of fears in Spain and Italy. China’s official GDP growth rate has fallen sharply – on Friday Beijing announced that GDP growth for the second quarter of 2012 was a lower-than-expected 7.6% year on year, the lowest level since 2009 and well below the 8.1% generated in the first quarter. This implies of course that quarterly growth is substantially below 7.6%. Industrial production was also much lower than expected, at 9.5% year on year. In fact China’s real GDP growth may have been even lower than the official numbers. This is certainly what electricity consumption numbers, which have been flat, imply, and there have been rumors all year of businesses being advised by local governments to exaggerate their revenue growth numbers in order to provide a better picture of the economy. Some economists are arguing that flat electricity consumption is consistent with 7.6% GDP growth because of pressure on Chinese businesses to improve energy efficiency, but this is a little hard to believe. That “pressure” has been there almost as long as I have been in China (over ten years) and it would be startling if only now did it have an impact, especially with such a huge impact occurring so suddenly. The most interesting thing is that even if CPI remains stable month-on-month, it will turn negative year-on-year in January 2013. And if it continues to decline month-on-month at current rates, we could see negative year-on-year CPI as early as August/September. Unlike some other analysts, in other words, I am not concerned about deflation persisting for long unless the PBoC cuts interest rates much more sharply than any of us expect. I know this may sound strange – most analysts believe that cutting interest rates will actually reignite CPI inflation – but remember that the relationship between inflation and interest rates in China is, as I have discussed many times before, not at all like the relationship between the two in the US. It works in the opposite way because of the very different structure of Chinese debt and consumption. After many failed attempts, over the past six months we may be seeing for the first time the beginning of China’s urgently needed economic rebalancing, in which China reduces its overreliance on investment in favor of consumption. Regular readers of my newsletter may be surprised to see me say this. For the past four or five years analysts have been earnestly assuring us that the rebalancing process had finally begun, and I had always insisted that it couldn’t have begun yet. Why? Because as I understand it rebalancing is almost arithmetically impossible under conditions of high GDP growth rates and low real interest rates. Once the real numbers came in, it always turned out that in fact imbalances had gotten worse, not better. Typically many of those too-eager analysts have resorted to insisting that the consumption data are wrong, although even if they are right this does not confirm that rebalancing had taken place since errors in reporting consumption have always been there. But this time seems different. Now for the first time I think maybe the long-awaited Chinese rebalancing may have finally started. Of course the process will not be easy. With China’s consumption share of GDP at barely more than half the global average, and with the highest investment rate in the world, rebalancing will require determined effort. The key to raising the consumption share of growth, as I have discussed many times, is to get household income to rise from its unprecedentedly low share of GDP. This requires that among other things China increase wages, revalue the renminbi and, most importantly, reduce the enormous financial repression tax that households implicitly pay to borrowers in the form of artificially low interest rates. Forcing up the real interest rate is the most important step Beijing can take to redress the domestic imbalances and to reduce wasteful spending. If my student is right (and this class has an impressive track record), this suggests that monetary easing is being driven by political considerations, not economic ones, which of course isn’t at all a surprise. But even with the rate cuts, perhaps demanded by the State Council, with inflation falling much more quickly than interest rates the real return for household depositors has soared in recent months, as has the real cost of borrowing. China, in other words, is finally repairing one of its worst distortions. China bulls, late to understand the unhealthy implications of the distortions that generated so much growth in the past, have finally recognized how urgent the rebalancing is, but they still fail to understand that this cannot happen at high growth rates. The problem is mainly one of arithmetic. China’s investment growth rate must fall for many years before the household income share of GDP is high enough for consumption to replace investment as the engine of rapid growth. As China rebalances, in other words, we would expect sharply slowing growth and rapidly rising real interest rates, which is exactly what we are seeing. Rather than panicking and demanding that Beijing reverse the process, we should be relieved that Beijing is finally resolving its problems. As an aside, we need to make two adjustments to the trade surplus in order to understand what is really going on within the balance of payments. First, one of the causes of last month’s weak imports has been a sharp decline in commodity purchases. I have many times argued that commodity stockpiling artificially lowers China’s trade surplus by converting what should be classified as a capital account outflow into a current account inflow. If China is now destocking, then China’s real trade surplus is actually lower than the posted numbers. Second, we know that wealthy Chinese businessmen have been disinvesting and taking money out of the country at a rising pace since the beginning of 2010. One of the ways they can do so, without running afoul of capital restrictions, is by illegally under- or over-invoicing exports and imports. This should cause exports to seem lower than they actually are and imports to seem higher. The net effect is to reduce the real trade surplus. Since these two processes, commodity de-stocking and flight capital, work in opposite ways to affect the trade account, it is hard to tell whether China’s real trade surplus is lower or higher than the reported surplus. But once de-stocking stops, we should remember that the trade numbers probably conceal capital outflows. How does all this affect the world? In the short term rebalancing may increase the amount of global demand absorbed by China, but over the longer term it should reduce it. Rebalancing will inevitably result in falling prices for hard commodities, and so will hurt countries like Australia and Brazil that have gotten fat on Chinese overinvestment. Rising Chinese consumption demand over the long term and lower commodity prices, however, are positive for global growth overall, and especially for net commodity importers. Slower growth in China, it turns out, is not necessarily bad for the world. The key is the evolution of the trade surplus. There is much more in his email that I wanted to use, but I stretched the bounds of fair use already. Those wishing to see more can follow Michael Pettis on his blog China Financial Markets which I consider one of the very few "must read" sites. The above report should appear on his blog shortly, with more details. Thanks Michael!